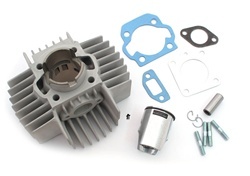 6 port puch 50cc 38mm tccd cylinder kit including cylinder, piston, ring, wrist pin, intake/exhaust studs and clips. this kit has a square port intake so any of these intakes will work..
super duper rad porting! very nice side ports with channels! very nice quality all around.. get to it! blast off! get a replacement piston here ! wow! I have had one of these 4 years now, with a stock Magnum head GPS at 44 mph. Just removed it to bump up to the 70cc, still looks like new inside. Ran 160:1 on accident during break-in. It survived! 300 miles so far. 40 mph flat, 15x40, 15mm bing, 74 jet. Power band starts quite high, 4 stars for crap low-end. Must reduce weight on your clutches for this one, mine engage at 3900 (stock 2-shoe @ 85.3 grams each), hits hard at 6000. Stock 50cc Puch 2-ring piston is MUCH quieter in this kit. Doesn't seem to affect power. Great kit to learn tuning on! put this jank on a stock za we had lying around..huge transfers and seems to have the power of the 70cc kit .. could be a real ripper and for the price get two like we did.. stock as stock za50 ...35 mph with no bing filter and a 60 jet ...imagine the possibility !!!!!!! this thing has some pretty nice porting for a cheap-ish 50cc kit. ran it with a boss pipe first and it was a total dog off the line, but GPSed at 42mph with my 145lb. on it and 15/45 gears. that's nearly 10,000 RPMs! not bad for 50cc! low end was better with proma circuit but still not great. maybe more clutch tuning would have done the trick? at any rate, great 50cc kit if you want something better than stock but milder than a 70cc.